Close your eyes and picture hand therapy. What comes to mind? Do you see an older patient squeezing a stress ball while cracking a joke about how PT stands for personal torturer? Someone making brownies or buttering toast while a bubbly occupational therapist plays cheerleader? Someone stacking cups or practicing threading a zipper? Although you would likely see many of these things occur in a hand clinic, hand therapy is so much more. Rehabilitation and management of the upper quarter can be a challenging but rewarding career. You might be surprised to learn that Certified Hand Therapists (CHTs) can be either Occupational Therapists (OTs) or Physical Therapists (PTs). They are board certified and obtain that certification through examination after 3 years of practice and 4,000 clinical hours of upper extremity treatment. The collaboration between both OTs and PTs, as well as the functional importance of the hand creates a unique therapeutic environment. Clinicians not only consider biomechanics, but really have an eye for functional movement, task efficacy and completion as it relates to activity and occupation. There is definitely overlap between typical PT practice and hand therapy practice as CHTs will also skillfully treat shoulders and elbows and consider cervical contribution. When should I consider referral to a CHT? Both physicians and other therapists should always consider a CHT for clients with complex upper extremity conditions, especially distal to and including the elbow joint. CHTs have comprehensive knowledge of the complex anatomy of the hand and digits, the need for proper balance and stability through the carpus to support function and upper extremity weight bearing and the nuances of proximal and distal radioulnar joints that allow for one hundred and eighty degrees of functional hand usage. Most hand surgeons refer their post operative cases to CHTs that they trust and work with regularly, but what about the patients that don’t need surgery that end up seeking therapy closer to home? Your practice may not have Certified Hand Therapists, however you can easily locate one in any state by visiting the Hand Therapy Certification Commission. So, let’s get to it. Here are the top 5 diagnoses commonly seen in an orthopedic clinic that should be considered for referral to Hand Therapy. The PIP and DIP joints are very commonly injured in sports requiring throwing and catching of balls. The mechanism of injury is often related to the finger being struck by a moving ball, another player, or an awkward landing during play. 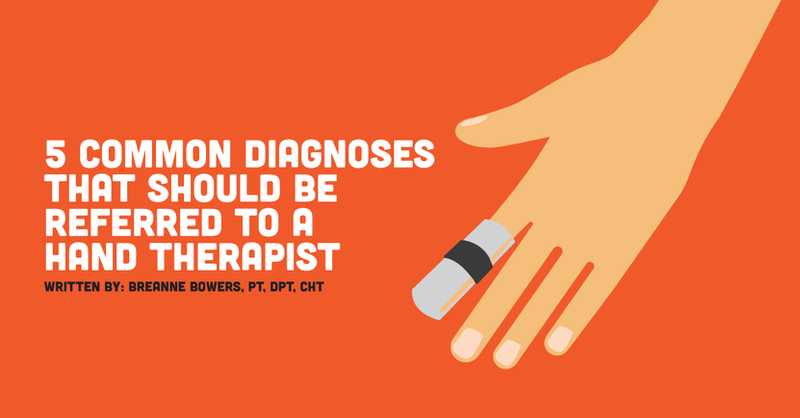 These are often splinted by primary care physicians, buddy taped by athletic trainers or ignored until weeks later when the finger has become problematic. When identified early, a CHT can often treat these conditions with minimal visits by initiating use of the correct orthosis and appropriate range of motion exercises to promote proper balance of the affected tissues. Identification of the correct structures involved and pattern of deformity are important for fabrication of the proper orthosis in order to minimize deformity and facilitate best possible hand function. Not all finger injuries are created equal and an over the counter, box splint that maintains PIP joint extension does not always effectively address the involved structures and deforming forces. When an orthosis is custom fabricated, the client is immobilized in the correct position to restore balance to the involved tissues while maintaining or regaining necessary range of motion of the surrounding joints. I know, I know. That is not a diagnosis. Or is it? Come on, we all know that patient, the one whose name printed on your schedule makes you cringe every Tuesday morning. They have shoulder pain, lateral and medial elbow pain, forearm pain and hand pain all at once. As a clinician these patients can be exhausting and it is very easy to get frustrated and focused on one anatomical area. I’m not saying you should send your local hand therapist all of your lateral epicondylitis patients—every good PT should feel comfortable treating this! However, that stubborn case that won’t go away may be worth a referral. CHTs study ergonomics, workplace injuries, posture and over-use problems at great length. They not only have knowledge of shoulder biomechanics and posture, but a thorough understanding of the biomechanics of the hand. They may look at the patient’s job task or daily activities with a fresh eye, or discover an imbalance in the wrist that is causing the individual to utilize their upper extremity differently. Wrist fractures can be pretty simple to treat, but they can also be very complicated and problematic . We’ve all been there: you’re working in an outpatient PT clinic and you get a random wrist fracture on your schedule. There may be an initial moment of panic for some, but hey, it’s kind of like a foot! Right? Many PTs can very successfully treat a wrist fracture based on their knowledge of healing timelines, biomechanics and exercise. Still, wrist fractures should be referred to hand therapists as the mechanism of injury that causes wrist fracture typically causes some soft tissue injury as well. Complications following wrist fractures can include instability between carpal rows, between radius and ulna or between the distal aspect of the radius and ulna and the proximal aspect of the carpal bones. More complicated wrist fractures require thorough understanding of wrist and hand anatomy as well as understanding of more conservative protocols. Hand therapists also have skills to fabricate protective upper extremity orthotics as well as progressive orthotics to improve wrist and forearm rotation when needed. Ulnar sided wrist pain can be an acute or chronic problem involving the triangular fibrocartilage complex (TFCC), Extensor Carpi Ulnaris (ECU), distal radial-ulnar joint, and/or the ulna. A fall on an outstretched hand is often cause for wrist fractures, but it may also cause some damage to the TFCC and surrounding structures. Ulnar sided wrist issues are typically problematic with weight bearing and rotational movements. Understanding the anatomy and functionality of the TFCC and ECU and imbalances that occur when these structures are not functioning properly is key to proper rehabilitation pre and post operatively. In many cases, acute ulnar-sided wrist pain can be managed well with conservative ulnar-sided wrist program, appropriate immobilization and activity modification. CHTs have a vast knowledge and understanding of these structures and their relationship to range of motion and function. Elbow fractures can be stubborn, and regaining range of motion can be a lengthy, frustrating process for both the client and the therapist. Hand therapists have a slight advantage as they can fabricate orthoses designed to provide prolonged end range time in desired motion throughout the night or during prescribed exercise periods during the day. Custom orthoses can be modified as the client’s elbow range improves, applying the same principles as serial casting in a more convenient, removable application. These can be more effective at gaining that pesky last 10-15 degrees of elbow extension or flexion than your typical turn-buckle device. Turn to a hand therapist! The listed conditions are in no way the only conditions you should or could consider referral for your patients. Hand therapists tend to consider function first and can be a great resource for other clients who need less aggressive programs emphasizing functional usage. This includes total shoulder arthroplasties and reverse total shoulder arthroplasties. Next time you’re struggling with an upper extremity client, or feel an individual could benefit from custom immobilization to provide rest and balance to affected tissue, consider referral to a hand therapist. Their outlook and skill set may be just what the doctor ordered.